The launch of Del Taco's tender and juicy Carne Asada Steak follows the brand's recent addition of fresh sliced avocado, a new line of Fresca Bowls and the introduction of Handcrafted Ensaladas; all part of a continued commitment to conveniently provide guests with high quality, delicious and UnFreshingBelievable® food for a great value. 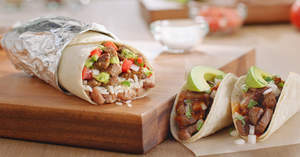 "With our Carne Asada freshly grilled in our kitchens, Del Taco guests can savor quality, flavorful steak served hot off the grill at the convenience of a drive-thru," said John Cappasola, executive vice president and chief brand officer, Del Taco. "Our fresh grilled Carne Asada, featuring an authentic blend of seasonings combined with our fresh ingredients, promises to leave carnivores across the country craving more." To complement the new Carne Asada Street Taco, Del Taco has also introduced a new signature Roasted Chile Salsa. The spicier salsa, made from a combination of three distinct dried peppers including toasted chile de arbol and smoked chipotle and California chilies and blended with ripe tomatoes and roasted onion and garlic, can be added to any menu item for an extra kick. At Del Taco (NASDAQ: TACO) all menu items taste better because they are made to order with fresh ingredients including cheddar cheese grated from 40-pound blocks, handmade pico de gallo salsa, lard-free beans slow-cooked from scratch, fresh sliced avocado and marinated chicken grilled in the restaurant. The menu, which includes a full line of breakfast, includes classic Mexican dishes such as tacos, burritos, quesadillas and nachos as well as American favorites including hamburgers, crinkle-cut fries and shakes. Del Taco's UnFreshing Believable campaign communicates the lengths the company goes to in order to deliver quality, made-to-order menu items created with freshly-prepared ingredients at unbelievable prices. With nearly 550 restaurants in 16 states, Del Taco serves more than three million guests each week. For more information, please visit www.deltaco.com.